Communities defining what health means to them and innovating on ways to address issues that perpetuate poor health despite disinvestment and systems failures is not a new concept. At CoLab, enabling agency and self-determination is at the heart of the work we do in partnership with communities at the margins, and for us, wellness based development is a growing piece of this work. Wellness-based development encapsulates the ways in which community and economic development impact health and wellbeing in the broadest sense, and also helps us connect the ways in which a lot of the development challenges that our partners face are linked to systems failures and poor health. Photo from a Northwest Bronx Community and Clergy Coalition convening on community health in the fall of 2016. Photo credit: Misra Walker. Part of CoLab’s approach with our partners is to tackle complex systems sector by sector, focusing on areas, like health, that present opportunities for landing alternate models. The passage of the Affordable Care Act and Medicaid reform, for example, have created opportunities for our community partners to engage healthcare institutions and other stakeholders around innovative strategies like investing in housing to address asthma in the Bronx, and researching and evaluating neighborhood health and change in the greater Boston area. I’ve seen the increasing recognition of the need for communities to be at the center of and driving conversations, projects, and initiatives aimed at addressing poor health outcomes and creating wellness. This is why I’m particularly energized that CoLab is a planning (and facilitation) partner in the upcoming Community Agency and Health Symposium being hosted by Bridging Health and Community. The symposium’s focus on shifting the conversation away from the biomedical model of sick care and uplifting the necessity of communities being front and center in cross-sector conversations about creating health is paramount. 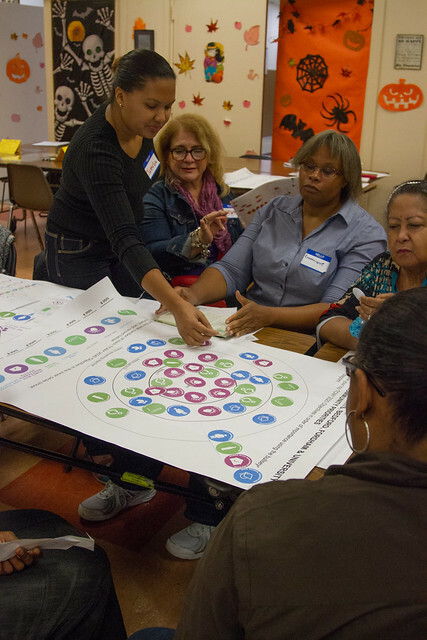 If you are interested in learning more through case examples from the Bronx, New York, and South Kern, California, on communities fostering agency to improve health, and connecting with other innovators building similar types of inclusive initiatives across the country, I encourage you to visit the symposium website and join us on May 15 and 16 in Oakland, California. For more reflections and insights from CoLab and some of our partners leading up to the symposium this May, check out the links below! CoLab’s Deputy Director, Aly Bryson, and I touch on CoLab’s “think, link, and do” framework, our health work, and collaborative innovation here. Leigh Carroll, board member of Bridging Health and Community, and a 2nd year MCP student at MIT’s Department of Urban Studies and Planning, discusses the importance of relationship building, particularly across silos, and highlights some strategies here. Carl Baty is a researcher participating in the Healthy Neighborhoods Equity fund evaluation and resident-driven research project, and Executive Director of Rounding the Bases. He describes how healing is about being able to express yourself, about people listening, and about acknowledging that what happened to you was not right (link). Maggie Tishman, Local Director for Emerald Cities Collaborative and CoLab fellow, shares the complexity of going upstream and talks about the Bronx Healthy Buildings Program here.